If you need a dynamic Gospel program for your church, community, or institution, and live in Central Pennsylvania or Maryland, consider having Magic Ministry provide the program. Jesus used stories or parables to illustrate divine truths. Magic Ministry presents the Good News of Jesus Christ through "visual parables" using Gospel magic. The trick or illusion in Gospel magic, like the story in the parable, is used to take some important or difficult Biblical truth, and present it in an entertaining way that people will remember for a long time. Gospel Magic uses otherwise standard stage and close-up magic tricks and illusions to proclaim the message of Jesus. Magic Ministry programs are suitable for fellowship events, youth programs, women�s groups, Vacation Bible Schools, Sunday School programs, nursing homes, Christian schools, and church suppers (to name a few). 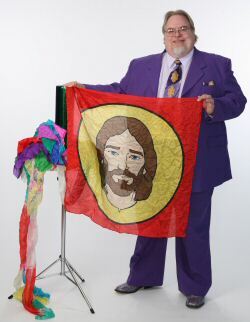 Gospel Magic presentations are appropriate for groups from age 5 and up. Gospel Magic is a great evangelism tool. Many people who would never come to church or Sunday School will come to a magic show. As an active duty Army Chaplain, Rev. Lantz discovered that many "macho" soldiers (who would "never be caught dead" talking to a Chaplain) would eagerly watch his Gospel tricks and ask for more. Magic Ministry has been presenting the Gospel in this unique way for over twenty-five years in the US, Germany and England. It is a program that has been very well received by Christians of all denominations.